The 459 bus from Salem sits in traffic on Otis Street in downtown Boston. The MBTA has a plan to improve bus service from the North Shore to Boston . . . by eliminating express buses. It may seem counter-intuitive, but Massachusetts Bay Transportation Authority officials believe eliminating some of the North Shore’s express buses into Boston, which often sit in crippling traffic near downtown, and instead running more frequent buses to the Blue Line will significantly improve local service in Salem, Swampscott, and Lynn, without making the commute too complicated for express riders. Trains from the Wonderland station, they say, will get to downtown faster than a bus stuck on a snarled highway. The rides would also be cheaper for passengers, because the cost of a bus and subway transfer — $2.25 with a CharlieCard — is less than the $4 express bus fare. The express buses don’t run often; even during peak periods, one of the routes only runs every 70 minutes. And the trip downtown is a long haul; scheduled travel times on some of these buses already tops 90 minutes, and they often run 20 minutes behind even that mark. Officials say pulling that express bus — the 459 between Salem and Downtown Crossing — and instead deploying it on the 455, between Salem and Wonderland, would reduce wait times on that route by 20 minutes. At 7.a.m, the combined local bus-subway trip would take about 95 minutes from Salem, according to the MBTA, compared to about 115 minutes for the express bus in traffic. By contrast, the commuter rail from Salem to North Station takes about 35 minutes, but costs $7.50. Similarly, eliminating two express buses between Marblehead and downtown would boost frequencies on shorter but similar routes that end at Wonderland. And the 424 from Lynn, which runs all the way to Boston for evening trips, would also now route those buses to the Blue Line. Dullea said that even though the Blue Line is the only MBTA subway branch with growing ridership in recent years, it still has room for even more riders. The changes are among the dozens of no-cost tweaks the MBTA has proposed as part of its long-awaited “better bus project,” a key part of the agency’s effort to improve an unreliable bus network that has seen a steep 6 percent ridership drop since 2016. The T is also pushing for more bus-only lanes on city streets and expanded service hours on several key routes. Other initiatives include shortening routes — such as one between Davis Square and Wellington — to run buses more frequently, or adjusting routes to speed up trips. All told, the T is making 47 adjustments to bus routes later this year, if approved by the agency’s governing board this spring. The entire list can be seen at betterbus.mbta.com/proposals. But first, the T must convince riders the changes will be worthwhile, including nearly 300 who take the North Shore express buses past Wonderland every day. The agency is holding public meetings in February and March to gather input on the various changes. The T operates about two-dozen express buses to downtown Boston, including from Watertown and Burlington. 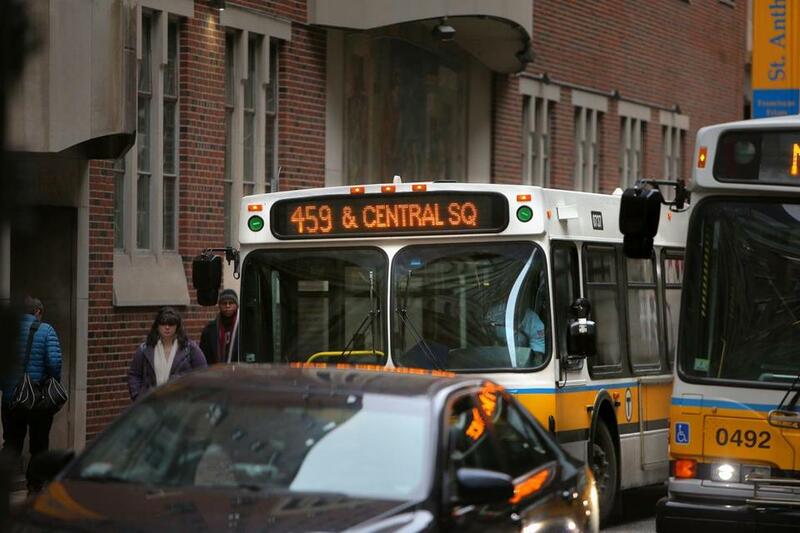 The T is only planning to eliminate four on the North Shore, while several express routes, such as the 434 from Peabody or 450 from Salem, both of which go to Haymarket, would continue. Otis Williams of Lynn said he usually takes the Blue Line to downtown, but one recent morning opted for the 459 express because it was “more convenient” to avoid the transfer, and at 10 a.m., the ride would was only about 45 minutes. Earlier in the morning, though, Williams said it makes more sense to take the Blue Line. “It’s worse when it’s rush hour,” he said. Later, the T will consider bus improvements that would cost more money — such as adding more buses. Eventually, the agency plans to revamp the entire bus map, potentially creating several new routes and eliminating others. Meanwhile, on the North Shore, riders could be in store for other transit improvements in the next couple of years; the T recently launched a study of how to make public transportation better in Lynn, which is expected to lay out strategies to improve bus and commuter rail service in the city of 94,000.